Junior Ranger, originally uploaded by The Bacher Family. 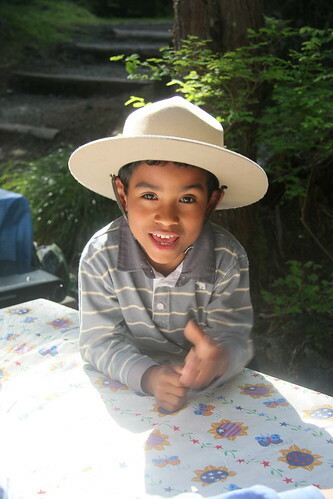 Carson is a return participant in our Camping Adventures program at Mount Rainier, and I made some good pictures of him in my ranger hat last year, too. This year he pilfered my hat when I set it dow, and had a grand time running around camp in it, as it slipped repeatedly down over his eyes. It's notoriously hard to get a good picture of a ranger in a stetson, because it creates such shadows over the face, but this time much of the light was reflected off the tablecloth, lighting the face from beneath. It burned out that part of the photo, but the face is so perfectly lit that it takes a while to even notice that. This is incredibly fine automatic exposure metering on the part of my camera!